Los Angeles Lakers star LeBron James reflected on meeting Michael Jordan for the first time as being "godly" as he prepared to face the Charlotte Hornets on Saturday. James was still in high school at the time and Jordan was embarking on an NBA comeback with the Washington Wizards. "It was godly," James told reporters. "I've said that over and over before, but it was like meeting God for the first time. That's what I felt like as a 16-year-old kid when I met MJ." James is now almost 34 years old and just 46 points behind Jordan for number four on the NBA career scoring list. "Any time I'm even mentioned with the greats that played this game and guys before me who laid the path, laid the grounds in this work and allowed me to be in this position, it's always humbling and gratifying for my city," James said, referring to his hometown of Akron, Ohio. "Just knowing where I come from, some of you guys know where I come from that's been there, and some of you guys haven't, but where I come from, there's not many of us. It's very limited. It's very, very limited inspirations. Very limited resources. Very limited everything. So for me to be in this position where I'm at today, it's just a blessing." James went on to praise Jordan for the impact he has had on the NBA, and said he is trying to continue the legacy the superstar helped create. "MJ made the game global," James said. "He made the game global. He made people all over the world want to watch the game of basketball because of his marketability, because of the way he played the game of basketball, because of who he was. He kind of transcended that era. "When MJ came in in '84 and started to do what he did, he made the game global. And obviously that '92 Barcelona run that the Dream Team had, it just solidified why he was the best athlete in the world to do as such. And then between MJ and David Stern, they turned it into what it is today, and guys like Adam Silver and myself are just trying to keep it going." 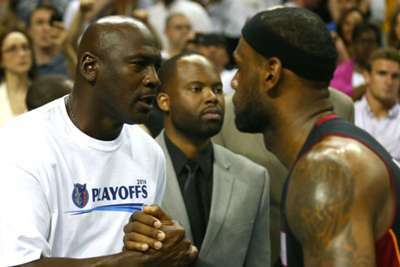 Jordan left an impact on the sport as he finished his career with six NBA championships and five MVP awards, while James has earned three titles and four MVP awards. The Lakers forward has played in each of the past eight NBA Finals and has helped turn around Los Angeles. They are tied for fourth in the Western Conference at 17-11.